This necklace contains four different types of wood, all having grown here at Manor House Farm. Larch is not a native British tree having been first introduced to this country in 1620. 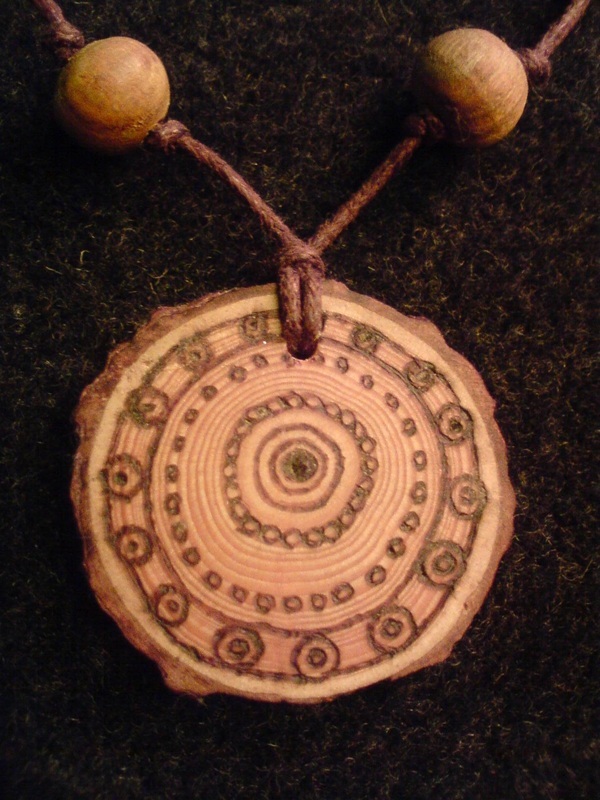 It has played a strong role in European folklore being said to protect against enchantment, wearing and burning larch bark was thought to drive away evil spirits and protect against the evil eye. The yellow coloured beads are from the Smoke bush ‘Cotinus Coggygria’ The Cotinus is a beautiful, deciduous shrub with red leaves and smoke like flowers. Its vivid yellow wood is rarely seen as it is not grown as a commercial wood crop, instead it is grown as an ornamental garden shrub. The red/brown beads are made from Apple Wood ‘Malus’. Throughout history the apple has been thought to have magical properties being called ‘the silver bough’ or ‘the tree of Paradise’ and has appeared in many folklore traditions as a powerful symbol. Due to their abundant autumn fruits they have come to be seen as a symbol for abundance, teaching us to give fully of ourselves, in the knowledge that we will be replenished. They also represent beauty, eternity, choice, temptation,,love, wisdom, fertility and youthfulness. 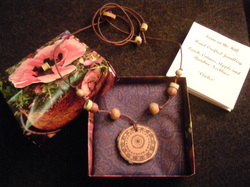 The greener coloured beads at the end of the necklace are made from bamboo. We planted a bamboo plant on the farm about ten years ago and these beads are from our first harvest. The design for this piece was inspired by the wood itself. 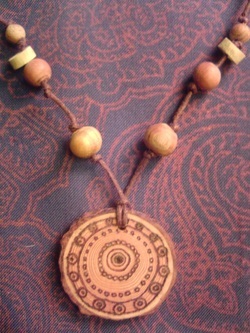 The strong, tight concentric circles of the grain can be clearly seen on the reverse of the necklace.